Case Atlantic is affiliated with Diesel Injection Sales and Service which has been providing fuel injection and related services for construction equipment owners and operators for more than 45 years. As a dealership, Case Atlantic has been operating for less than two years. However, in that time, it has developed long-term partnerships with customers in the local construction industry by reinvesting in additional products and services. In its first 12 months of operation, it has been very successful offering new equipment in just about every category including skid steer loaders, backhoes, wheel loaders and excavators. As of December last year, it is now a one-stop shop for compaction machinery. “That’s something that we didn’t have, especially for road construction contractors. We didn’t have anything for paving, asphalt and road preparation… we needed a complete compaction line,” says Geoff Pearcey, Principal of Case Atlantic. All of that changed after General Manager Ron Scott suggested they look at Ammann after witnessing the gains the company was making in European markets. 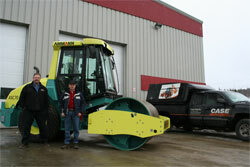 The deal was sealed when Peter Price, Area Sales Manager for Ammann in Canada paid them a visit. Case Atlantic didn’t waste any time announcing the new partnership as it took its first Ammann roller to the Newfoundland and Labrador Road Builders Association annual meeting in January for its initial product launch. Price supported Case Atlantic by joining Steve Tucker, Sales Representative for Case Atlantic at the event. Tucker says he was very pleased by the reaction he was getting. “People were looking and asking questions. It’s new for some of them who were not necessarily familiar with the name. They were quite interested because they could see that this was high quality equipment. They are definitely interested in trying it out and having a better look at it in the spring,” says Tucker, adding that he expects more queries when the construction season starts back up. The company will also be marketing the new line through its sales team led by Steve Tucker as the point sales man who has already been making in-roads with customers. In addition, it will also organize a “demo days” event in April or May to give its clientele a first hand look at its new Ammann line. “We had our official grand opening last year and we had about 300 people come through,” he says adding that the event featured a backhoe rodeo and family oriented activities. “This year we will do the same thing with the Ammann line being prominently featured and Ammann personnel will be down for that,” he says. For the smaller Ammann machines such as the reversible plates and tampers, Case Atlantic will exhibit at the landscaping show that takes place every spring to showcase the compaction line best suited for landscapers. The company will also act as a direct sales channel to the equipment rental industry. “Ammann sets up its distribution channel so that we have the opportunity to deal with the rental houses and we will be certainly doing that as well this year,” says Tucker.